Hope for the Hopeless | Grandpas Can! The second part of Charles Mulli’s story, focusing in on the lives of the kids before and after arriving at the home of MCF. 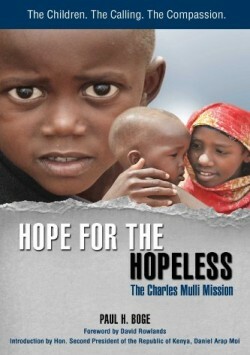 Hope for the Hopeless continues the journey of Charles Mulli started in the best-selling biography Father to the Fatherless. Six year-old Charles Mulli was abused by his father and abandoned by his family. Forced to beg from hut to hut in Kenya to survive, Mulli worked his way out of poverty and became a wealthy businessman. Despite all his success, the growing struggle of the street children in h remained strong in his heart. Hearing the call of God on his life, Mulli sold everything he owned and began rescuing street children from the slums of Kenya and gave them a home at Mully Children’s Family. His journey of faith challenges him to trust Christ in desperate times, confront evil forces and believe God for even greater miracles of healing and deliverance. It takes him into the heart of the most devastating event in recent Kenyan history, where in the wake of the postelection violence that shook Kenya to its core, while the nation stands in fear and desperation, Mulli risks everything to follow the call of Christ on his life to bring hope to the hopeless. People will be greatly moved by these amazing true stories. Each tells of a tragedy turned miraculous. Whether the young girl evicted by her family and left to survive in a slum or the boy whose parents passed away, leaving him destitute on the street, all appear hopeless cases until they encounter Charles Mulli and discover a new life they could not have imagined. This book is as impossible to put down as it is heartbreaking. Everyone needs to read this; we need to see that destitute children in Africa are no more just a statistic than our own dear children are. This is real.